The United States Mint made the first Standing Liberty quarter in December of 1916. Before that, the Barber quarter had been in existence for more than 25 years from 1892 until 1916. This new design was part of the Treasury Department's overhaul of United States coinage designs for the dime, quarter and half dollar. In March of 1916, Hermon Atkins MacNeil's designs for both the obverse and the reverse were chosen to replace Charles E.
Barber's stoic design on the quarter. The original designs that MacNeil submitted had Lady Liberty standing between two piers inscribed with "In God We Trust," thirteen stars (seven on the left pier and six on the right) and McNeil's initial "M" in the lower right. Lady Liberty is holding a shield in one arm to symbolize protection and an olive branch in the other hand symbolizing peace. The first subtype of this coin has drapery across Liberty's body exposing her right breast. Approximately halfway through 1917, a second design was introduced that covered her upper body with a coat of chainmail. In 1925 the date was recessed to help protect it from wearing away prematurely. The original reverse has an eagle in flight with seven stars on the left side and six stars on the right side. When the United States Mint redesigned the obverse, the reverse was also modified to place the eagle higher on the coin and move three of the stars beneath it. There are quite a few mint errors and die varieties that make this an exciting series of coins to collect. Unfortunately, 1916 has a mintage of only 52,000 coins. This makes it extremely rare and expensive in any grade. In 1917, almost 12 million coins were minted with the original design showing lady liberty's right breast exposed. The design was modified to put a coat of chain mail on Lady liberty and cover her breasts. About halfway through 1917, the mint changed obverse and the reverse design on the Standing Liberty quarter. On the obverse, Lady Liberty's exposed breast was covered with a coat of chainmail. The reverse redesign included changing the seven stars on the left side of the coin and six stars on the right side of the coin to having five stars on each side of the coin with three stars underneath the eagle. Looking at the reverse is the easiest way to tell Type 1 from Type 2. Beginning in 1925, the date was recessed below the rim so that the numerals are protected and less likely to wear away. The recessed date subtype is known as a Type 3 Standing Liberty Quarter. Mint Mark Location Above and to the left of the date. 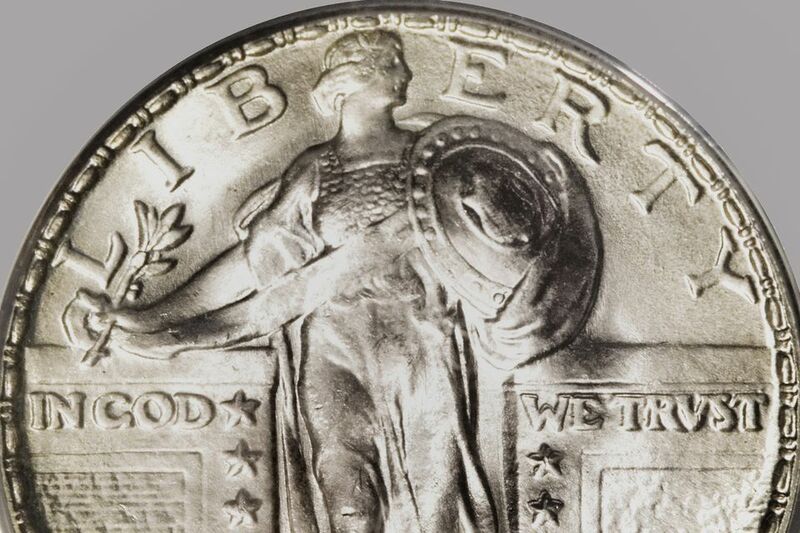 Obverse Description Type 1: Liberty standing in a gateway, right breast exposed, holding a branch in right hand and shield in left. LIBERTY above, IN GOD WE TRUST is lettered on the parapet on each side. The date is on a pedestal beneath her feet. Type 2 and 3: Liberty standing in a gateway, torso covered armor or mail, holds a branch in right hand and shield in left. LIBERTY above, IN GOD WE TRUST is on the parapet on each side. The date is on a pedestal beneath her feet. It was recessed in 1925 so that the numerals in the date were below the rim of the coin. Reverse Description Type 1: Eagle flying to the right, with UNITED STATES OF AMERICA and E PLURIBUS UNUM above, with QUARTER DOLLAR below. Seven stars are to the left and six to the right. Type 2 and 3: Eagle flying to the right, with UNITED STATES OF AMERICA and E PLURIBUS UNUM above. Five stars are to the left and right, three stars below. QUARTER DOLLAR at the bottom. Notes Since the design change that recessed the date occurred at the beginning of 1925, some resources do not recognize Type 3 as a separate type or variety. The Standing Liberty quarter was minted as indicated in the following table. The table lists the years, strike type, mint facility where made, the mint mark used on the coin and a description of any type differences in coins minted for that year. The following are popular errors and varieties that Standing Liberty quarter collectors look for. These coins usually carry a premium and are valued above a common coin. Mintage figures for the Standing Liberty quarter by mint facility are detailed below. Some numismatic scholars and researchers disagree that proof coins were produced in 1916 in 1917. At best they will agree that these coins were special mint strikes. Where possible, production numbers by strike type are noted. A Guide Book of United States Coins (The Red Book); Yeoman, R. S., (Kenneth Bressett, Editor); Whitman Publishing, Atlanta (annual).